Tassel Ears” (Figure 1) are showing up in corn fields around Ohio. Corn is the only major field crop characterized by separate male and female flowering structures, the tassel and ear, respectively. In most corn fields it is not unusual to find a few scattered plants with a combination tassel and ear in the same structure - a "tassel ear". The ear portion of this tassel ear structure usually contains only a limited number of kernels. Tassel ears often appear on tillers (suckers) arising from plants with normal ears and tassels. These tassel ears are produced at a terminal position on the tiller where a tassel would normally appear. However, tassel ears may also be produced by individual plants and often occur in shorter spindly plants associated with delayed emergence and uneven crop development. 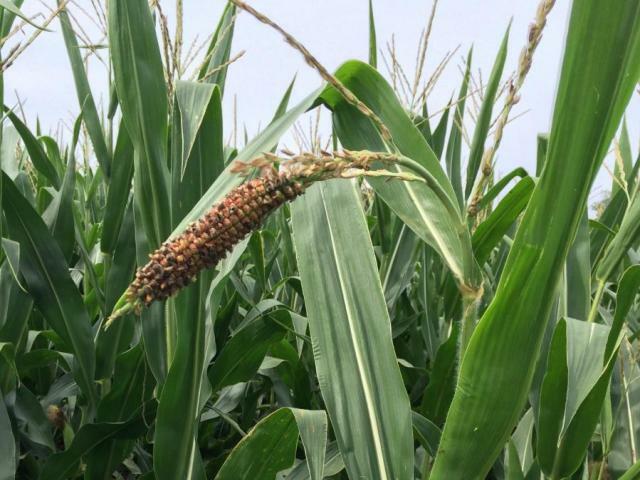 Tassel ears are often produced by tillers that result when the plant’s growing point is destroyed or injured by hail, wind (green snap), animal feeding, frost, flooding, herbicides, and mechanical injury. Some hybrids may also be more prone to tiller under certain environmental conditions and these tillers may give rise to tassel ears. Low plant density may also promote tillering. Tassel ears are a reminder that the male and female parts of the corn plan are structurally very closely related. Wild progenitors of corn-teosinte spp. have complete flowers tassels and silks together. These can be crossed with Zea mays (normal corn).